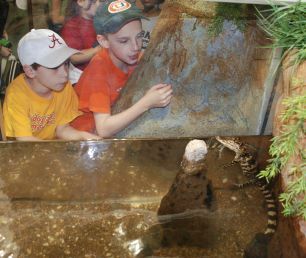 Alabama youngsters greeting an alligator at the 4-H Environmental Center in Columbiana. Following is a considerably revised version of a piece I wrote on sustainability-plus earlier this week in response to the federal funding crisis. This version was written specifically for our Extension county coordinators to use in their local media. I’ve felt strongly for some time that Extension’s growing emphasis on sustainability-plus is one of our greatest assets — certainly during this critical time as we work to remind funding sources of our continued relevance. Increasingly, our efforts are no longer devoted solely to sustaining natural resources but also to sustaining social, cultural and financial assets. Interestingly, many of the state’s governors are grasping the sustainability-plus concept, using sustainability to encompass a much wider public policy range. For a number of reasons, Extension is uniquely positioned to benefit from this changed perspective. This issue is more widely explored in an earlier piece: Sustainability: The Future of Cooperative Extension Programming. Feel free to use this material in any way you please. If you doubt that, undertake a Google search of recent state-of-the-state addresses around the country. It would reveal the extent to which this new mindset has taken hold of Americans from one end of this country to the other. In many of these addresses, governors used “sustainability” to underscore in these austere times how effective stewardship must encompass all aspects of our lives, not just the environment. Meanwhile, New York Gov. Andrew Cuomo unveiled a Cleaner, Greener Communities initiative to provide competitive grants to encourage grassroots sustainable growth strategies. Yet, these are only a few examples among many of how these lean times are calling for new ways of thinking. Farmers are struggling to adopt new technologies to feed an estimated 9 billion people by midcentury with less cropland and water and in the midst of spiking fuel and fertilizer costs, even as they are being pressed to develop safer, greener food production systems that emphasize organically and locally grown foods. Meanwhile, growing strains on the U.S. healthcare system are forcing a greater emphasis on preventative health measures. Americans increasingly are being called on to adopt effective dietary and exercise practices to safeguard against obesity-related diseases, such as hypertension and type-2 diabetes. Fiscally-strapped communities are scrambling to develop sustainable growth strategies for housing, transportation, emissions control, and energy and efficiency. In a sharp departure from previous decades, all levels of government are challenging Americans to address change directly rather than waiting for things to happen. Cooperative Extension is uniquely equipped with the skill set to meet these new policy requirements and to provide Americans with critical tools for self-empowerment. In our state, Extension already is actively engaged in grassroots efforts to help these groups and many other people follow through with the environmental, economic and lifestyle changes that these lean times require. Yet, in the midst of this crisis, Extension is dealing with one of its own. Looming federal budget cuts, especially to the Smith-Lever program, which supports nationwide Extension efforts, would seriously undercut efforts to transform the American agricultural sector in this critical time in history and to ensure that Americans eat healthier, nutritious foods. Moreover, proposed cuts in the Agriculture and Food Research Initiative would drastically scale back the competitive grants that support critical efforts aimed at securing healthier, more sustainable food production systems. We in Cooperative Extension are passionate about our role in helping Americans through these lean times. Yet, even as government searches for cost-effective solutions, these reductions threaten to undermine ongoing efforts to help Americans meet some of the most critical challenges in our history. Extension has a charge to keep in this age of austerity, not only in demonstrating the value of recycling and adopting greener production systems but also in showing how sustainable principles relate to every aspect of our lives. Help us sustain this critical resource. Contact your local congressional member and ask him or her to restore this funding.